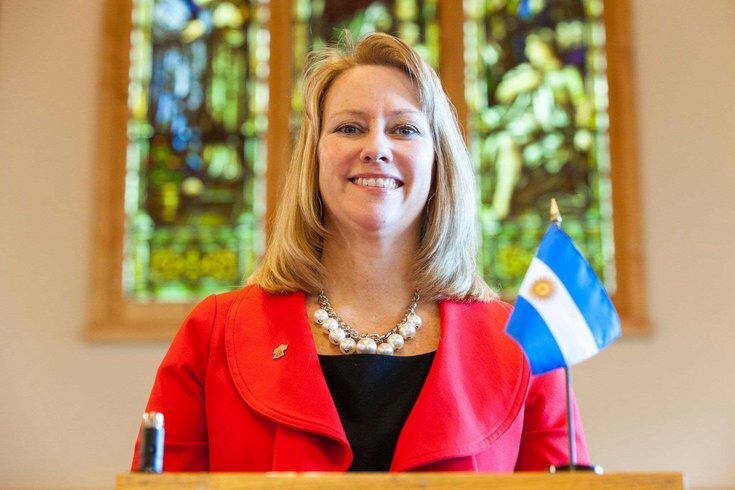 Donna Crilley Farrell, executive director of the World Meeting of Families 2015 in Philadelphia, stands with an Argentine flag honoring Pope Francis placed in a time capsule to mark a new atrium at the St. John Neumann Shrine in Philadelphia. Pushing up the sleeves of her leopard-print cardigan, Donna Crilley Farrell reaches over to a shelf and grabs an enlarged color photo. Just a dot in a pixellated throng, listening to Pope John Paul II as he led Mass on the Benjamin Franklin Parkway. Plucked from Springfield’s Cardinal O’Hara High School to serve as a volunteer usher, the 15-year-old was enormously moved. But she will, and this time, Farrell won’t just be one in a million. Thirty-six years later, she’s the executive director of the World Meeting of Families (WMOF), which will bring another pope, Francis, to town this September 27-28. For Philadelphia, it means the first papal visit since that October day in 1979. It is also Pope Francis’ first papal visit to the United States, an occasion that has the Catholic faithful and critics anxious with anticipation. Not only will Pope Francis offer a Sunday Mass, but he will attend the family festival on the Parkway on Saturday. The WMOF conference — the eighth convened and the first in the United States — is expected to draw up to 15,000 delegates during the week. By the time Francis arrives for the weekend, the number of incoming pilgrims may exceed 1 million. Someone has to manage it all. Operation central for Farrell and her small staff is in a suite of offices at the Archdiocese’s headquarters near Logan Circle. Drawings by school kids entreating the pope to come to Philly, and framed posters of newspaper front pages offering confirmation that he will, line the walls. Right now, Farrell is working on a plan to get the meeting’s volunteer program underway. She anticipates a need for as many as 10,000 willing helpers. And there are meetings, lots of them. She’s met with the Archdiocese of New York, which last welcomed a pope (Benedict) in 2008, as well as with the organizers of the previous World Meeting of Families, which was hosted by Milan in 2012. She spends a lot of time chatting up business, philanthropic and civic leaders to educate them about the meeting — and, in some cases, to solicit financial help. And she gathers regularly with city officials to discuss matters related to logistics, security and transportation. “The mayor is fond of saying, ‘We’re the city that does big events,’” she says with a smile. Still, the scope and breadth of this particular event — and the papal visit — require consummate skills at balancing varied demands, expectations, requests. “We are working closely with the Vatican on planning, though nothing specific has been confirmed,” Farrell offers. As far as security issues go, they’ll be governed by federal, state and city agencies and will trump most other concerns. It’s enough to occasionally jolt her from her sleep. The pope is coming — and she’s helping to make it happen. Farrell was raised in a Roman Catholic household where faith was central: Her parents never skipped church, prayed daily and draped rosary beads over the bedposts. Seeing John Paul II on the Parkway that sunny afternoon lit a spark inside her, although it took her awhile to realize that. After graduating from the University of Pennsylvania with a communications degree, Farrell bopped around the Northeast in pursuit of a career in broadcast journalism. Covering murders and accidents for more than a decade eventually took its toll, though, and she began looking for more soul-satisfying work. She found it back home when a position as director of communications opened at the Archdiocese of Philadelphia. She pauses, then laughs softly. From sexual abuse scandals to school closing controversies, Farrell had joined an organization that was constantly under fire. And so, after leaving the Archdiocese for an irresistible opportunity at Independence Blue Cross, she’s returned full throttle. About 40 percent of Americans live within a day’s drive of the city, and “sometimes, I feel like they’re all coming,” she says. It’s a tourism official's dream. But although they, along with Farrell’s office, will undoubtedly make recommendations about Philadelphia stops other than the Parkway, no specific itinerary has been finalized. Personally, too, Farrell is relishing the “opportunity of a lifetime,” albeit one that often finds her on the laptop at home after the kids have gone to bed. Observing her faith with her husband, attorney Michael Farrell, and their twins, Christina and Connor, helps keep her steady, even as she mourns the recent loss of her father. In her kitchen, the same aerial view of the previous Parkway Mass, posted on her fridge, beckons: It's a constant reminder of what’s ahead. There are the people who ask if she can arrange a meeting with the pope (er, ‘No!’), and there’s speculation that someone from the Obama administration might pop in, adding further logistical and security nightmares (no one’s yet approached WMOF, she says). “The No. 1 question I get asked is, 'How can I help?'" she points out. “So many people are committed to making it a success that I know it’s not just Donna standing here alone,” she adds. “That photo isn’t daunting; it's about crossing the finish line."